Obituary – Thele, Edward Albert « Perry High School Alumni Association, Inc.
– son of Mr. and Mrs. L. W. Thele of Perry, was born in Coffeyville, Kans. on Jan. 13, 1920. He attended the elementary grades at the St. Joseph Academy and attended Perry High School and the Academy. 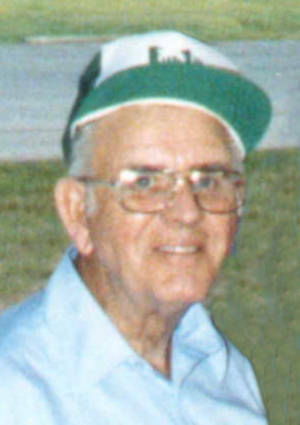 Edward A. Thele, age 83, of Oklahoma City, OK passed away September 10, 2003 in Quincy, IL. 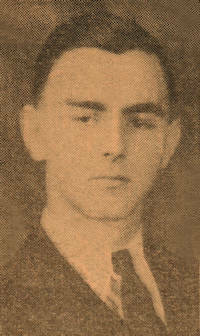 Edward was born January 13, 1920 to Louis and Anna (Miksch) Thele in Coffeeville, KS. The family resided in Perry OK.
Edward married Delores N. Cooper in 1940, afterwards moving to Enid OK, later moving to Oklahoma City, where they have been long time members of Sacred Heart Catholic Church. He was a carpenter in United Brotherhood of Carpenters and Joiners of America Local 121 in Oklahoma City, later elected business agent, then as Regional Training Director for the United Brotherhood in Washington D.C. He has been a member of the Knights of Columbus since 1938. He and Delores were members of Carmarco Club, also loved to dance. Delores preceded Edward in death in 1988. He is survived by two daughters and one son, Loretta (Don) Jones, Quincy, IL; Linda Bacon, OKC, OK; and Danny (Betty) Thele of Whitesboro TX, grandchildren Lori (Jim) Geweeke; Lisa (Lance) Higdon; Darren Jones; Wade Appelbaum (Mary Demchak); Mark (Leslie) Appelbaum; Angela Thele, Deanna Thele and Ryan Thele; great grandchildren, Chad Dedert, Cara Briscoe, Clint Dedert, Joseph Appelbaum and Douglas Demchak; sisters Gertrude Chessmore, Regina Luetkemeyer of OKC, OK; Mary Nelson of Stillwater OK; one brother Louis (Mary Claire) Thele of OKC, OK; one sister-in-law, Sally Thele of Glen Ellyn, IL; many nephews and nieces. He was preceded in death by his parents, sisters Catherine Stockinger of OKC, Anna (Troy) Tilman of Owasso, OK, Frances (Harold) Bohl of Augusta, WI, Dorothy (Eli) Wells, Cushing, OK; brothers Leo (Molly) Thele, Roswell, NM; James Thele of Chicago Heights, IL. Family will visit with friends and relatives at the funeral home Sunday 4-6 p.m., with rosary service to follow. Funeral Mass at Sacred Heart Catholic Church Monday 10 a.m. Interment at Grace Hill Cemetery, Perry OK. In lieu of flowers, the family requests donations to your favorite charitable organization or to American Heart Association or American Cancer Society.